There was a point during high school when I attempted to create a game. It was meant to be a King’s Quest-style point-and-click adventure that starred a dollop of sentient whipped cream (or possibly mayonnaise). This didn’t end up going very far, and my gamedev hopes wound up stalling out for good when I discovered that animating pixels isn’t as easy as filling notebooks up with pencil doodles. But that difficulty hasn’t stopped two teenagers in Jaipur, India, who have created Alter Army – a strange and surprisingly deep combat platformer that launched this month. 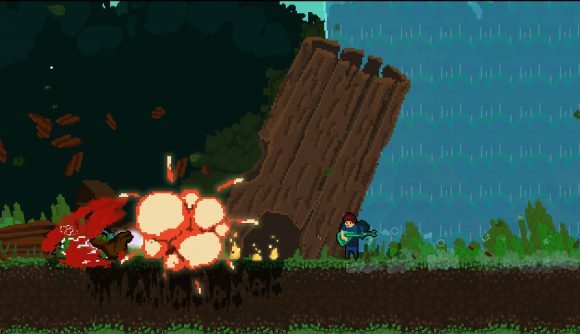 They’ve made something that evokes both Vlambeer’s Nuclear Throne and Hopoo’s Risk of Rain, but is distinctively its own thing. You begin by selecting one of four zany characters, and then proceed into the forest, fighting monstrosities to a thumping soundtrack led off with what sounds like an electric sitar. Alter Army’s developers are Mridul Bansal and Mridul Pancholi, who have been working on their game since they were both 14, balancing development against schoolwork and the occasional need to sleep. They’ve called their studio Vague Pixels. There are some distinctively teenage-doodle aspects to Alter Army, like a man urinating a heavy stream of red fluid against the side of a building, and a character who destroys enemies with a guitar. But that’s matched with some impressive mechanical design and execution: combat feels punchy and technical, there’s a well-implemented double jump (which I understand is a tricky thing to get right), and even the air dash from Ori and the Blind Forest. It’s tough, too. I haven’t progressed very far into the first world yet, but the acrobatic, bloody fights keep me coming back for more, even if it’s a little rough around the edges in some places. You can always check out our list of the best new PC games of 2018. Alter Army launched August 6 on Steam, and the developers say they’ll be pushing out updates – “We are still committed to Alter Army and we will be until we deliver the game we would’ve fell in love with if we saw this two years ago,” they wrote in a post to their Steam page. You can pick up a copy for $4.99 USD.